As you probably know if you're American and reading this, Friday was Veteran's Day. Though the kids had school, Matt had the day off. He still went into work for a little while that morning, so I joined my friends for play group (because they are some of my favorite people here). As the group started talking about lunch, I texted Matt to see if he was home yet because if he wasn't, I would go out to lunch with them. He texted back, "Yes home but cleaning the apt. Go eat with your friends." You guys. MAJOR heart eyes. Even if he wasn't so dang cute, I'd be madly in love with him because of exactly this. He spoils me!! The apartment looked so good when I got back that I took these two pictures of our living/ dining/ music room/ kitchen. I knew it wouldn't last past the snack time that follows our kids' return home, but I wanted to remember what it looked like for those sweet, however brief, moments. I just realized I didn't straighten the pillows on the couch after I'd flopped down on it. I'm definitely no stylist or interior decorator, but you get the idea. Anyway, these pictures inspired me to write a post about our "home" here. 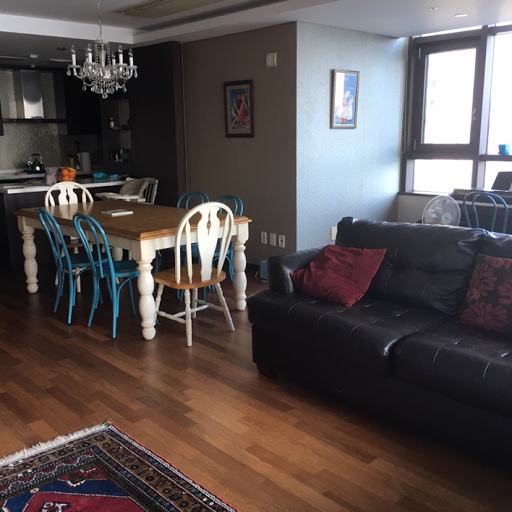 Honestly, I think the prospect of living in an apartment was one of the most daunting aspects about moving to Korea. There may have been a very short time, probably in my teen years, when I thought, Yeah, living in an apartment would be cool. But by and large, I've felt that apartments are teeny little boxes piled on top of each other, and I would run the other way instead of even consider living in one. In fact, when I talked in this post about how I cried so hard about moving to Korea, the tears started as we were watching the House Hunters International that takes place here. I just saw all those apartments and felt claustrophobic and terrified. But for the most part, I'm honestly enjoying our apartment. It's probably 1,000 square feet smaller than our last house, but I always felt like that was a lot of wasted, unused space. We have four bedrooms, and they are all a decent size. Wyatt's room is the smallest, but there is still space for his bed, a dresser, a small desk, shelves, and the IKEA play kitchen. I think it helps a lot that we have tons of huge windows. Without them, I'm sure I would feel claustrophobic. And we have an absolutely amazing view -- one that we couldn't afford if we were living in the States. There is, of course... well, lots to get used to. There's the parking garage. I am really not a fan of parking garages, and ours is four levels deep. They are painting the floor of each level right now, so we have to keep our bikes in our apartment, which is really driving me crazy. There's the obvious problem that I can't tell the kids to just go play in the yard for a few minutes while I cook dinner or something. Before we knew we were moving here, but we knew we were moving somewhere, we'd told the kids that we would look for a house where we could have a treehouse and swings. Now, I'm thankful for the playgrounds in our neighborhood, but I do miss having a little yard space. I do not, however, miss yard work. At all! Silver lining!! There is the feeling that someone is always close, watching or listening. As I look up from my writing right now, I can see four towering apartment buildings. If I moved just a little, I would see more. It's hard not feel like there are thousands of eyes on us. Also, I know our family is not the quietest. I try to be respectful of the downstairs neighbors who probably think there is a herd of adult elephants living above them, but I also feel like kids should be allowed to be kids sometimes. The people upstairs from us tend to only stomp around late at night or in the wee hours of the morning, so I feel like I can say that at least our noise only really happens at reasonable times. But it's a little strange when you're in the bathroom and you can hear voices coming through the walls or pipes. Probably, though, the two things that have been most challenging for me to get used to are 1) the garbage system and 2) the laundry. We have a large "garbage room" on the ground floor. The walls are lined with several bins, one each for: paper products, clothing, plastic food containers, plastic bottles, glass, small plastic items (like pill bottles, yogurt cups, etc. ), styrofoam (ask me right now how I feel about styrofoam packing peanuts), plastic bags, another glass bin, and metal. Then there is the stinky wall. On this side, there are the bins for kitchen waste (compost stuff plus meat), and the general, everything-else dumpster. The food waste goes into special bins with lids that open and close when you scan this special card, but it smells so bad. So, so bad. You might be reading this and thinking, Wow! Way to go! Such green living!! Yes, I would have thought so too. We throw away so much less than we used to. But it is so darn tedious separating everything. Think about my last post, the plastic bags and bottles and what I used them for... I don't blame you if you're shuddering. Anyway. If you're a mom, particularly with small children, think about your dustpan when you've swept the floor around your table. There are probably things like Cheerios and some Goldfish crackers, plus maybe the plastic wrapper that contained the cheese stick your son ate and then accidentally knocked to the floor, plus the little scraps of paper from the art project your daughter is working on for school. Right? Now, separate those items. It doesn't sound so bad every once in a while, but several times a day every day of the week, and you will about lose your ever loving mind!!!! And then the laundry. We put certain items into storage in the States, and some of the hardest to part with for two years were my washer and dryer. About two years ago, we bought a wonderful, large-capacity top-loader. I miss it so much. I could throw comforters in it, my king-size bedding plus a couple towels, or more clothes than I could carry in my arms. Here I have a very small front-loader. I can wash the sheets from my bed, but barely and that's it. I'm scared -- truly scared -- about my kids throwing up in their beds because I literally do not know how I will get all their bedding clean. Most apartment buildings have a laundromat downstairs, and while I love this apartment, one of its biggest drawbacks is that there is no downstairs laundry. Because then there is the issue of the dryer, too. I don't have one. Yup. Five kids and no dryer. Supposedly my washing machine can also dry clothes -- if I want to sell an organ to pay for the electricity if I do that all the time. But I've tried it, and it seems that feature doesn't actually work anyway. So on the days when I wash the sheets, I spread them all over the couch and make tents with the dining chairs and the laundry rack I purchased, and I turn my fans on them. It's not ideal -- so very not -- but it sort of works eventually. Sometimes, though, I get to missing things like... sheets that are all the way dry when I put three in my bed... or soft towels. When they dry on the rack or over chairs, they're always stiff and scratchy. But what I've been thinking about through all of it are Philippians 4:12-13, "I have learned the secret of being content in any and every situation, whether well fed or hungry, whether living in plenty or in want. I can do everything through Him who gives me strength." I want this to be me. And frankly, it's not. I often pray that God will "expand my comfort zone," but when He does, I balk. I want to dare big and dream big for Him, and then -- even with my million-dollar view -- I grumble about stiff towels. What I know for sure is that I need to practice contentment. Can I take out the garbage without feeling bitter about incredibly tedious it is? When I take that towel off the drying wrack and it's so stiff and crispy it barely even resembles fabric, can I just be grateful for the fact that it will get me dry next time I take a shower? (Or that I have hot, running water to take a shower in?) When one of my littles is throwing a tantrum, and I feel like there are eyes and ears everywhere, judging me as a mother, can I just look up and lean hard into God's grace? "Be content with what you have; rejoice in the way things are. "Sometimes, though, I get to missing things like... sheets that are all the way dry when I put three in my bed"
ahaha! Oh, I can relate well to this post! 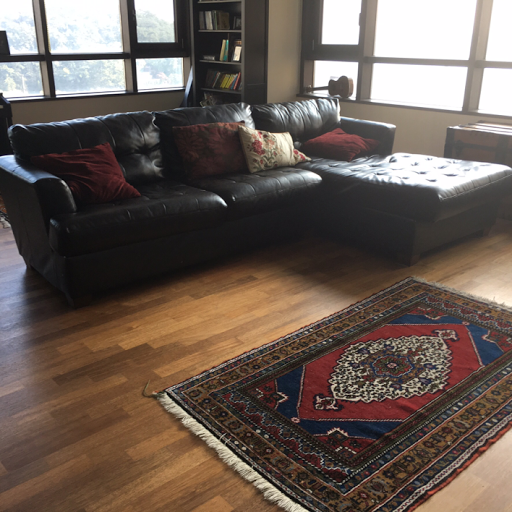 My family moved from our Malaysian house into an apartment to cut costs shortly before I moved out to get married--the apartment is a total of 1000 sq. ft. and at the time all seven of us kids lived at home, so 9 people lived in that apartment. 3 bedrooms--5 sisters shared one, my brother got his own room but had to share it with all of the homeschool bookshelves, and I slept on a foldout cot in the pantry off the kitchen until I moved out. haha! My parents and 3 of my siblings still live there, but the apartment becomes a little more reasonably sized with every kid that moves out. When they first downsized to the apartment, they finally got a dryer after 6 years without one, and my mom loves it. Angel and I don't have a dryer, and didn't have one in China either, but that's honestly easy with just the two of us, plus, as long as I lived with my family overseas, they didn't have a dryer either, so it feels normal. I also dry my sheets by draping them over the chairs in my dining room. Is there any other way to do it? :) Our China apartment was so small that in the kitchen I could have washed dishes, gotten food out of the mini-fridge, and cooked on the stove all without moving from where I stood...because there was no other place to stand. And it didn't have any heat, and where we lived, it got down to about 40-50 degrees for about two months in the winter. And the homes just don't have heat? I had a little electric heater and pointed it at myself wherever I was at home, and brought a hot water bottle to the office and to the (also unheated) classroom. Living conveniences in different countries are such an interesting topic to me--though I've never been to Korea, yet!